Frankfurt 2009: Ford C-Max | What Car? The all-new C-Max MPV is the biggest story on the Ford stand at Frankfurt. As well as giving a taste of what the next Focus will be like, the C-Max is interesting because Ford will offer both five- and seven-seat versions, whereas the current model only has five seats. This follows the example set by Renault with the Scnic and Citron with the C4 Picasso. Uniquely, Ford has devised two different door and seat arrangements to ensure access and versatility arent compromised in either version. The five-seater C-Max will have conventional-hinged rear doors and a seat layout similar to that in the present car, while the larger Grand C-Max has sliding rear doors and whats described as an innovative new seating concept. This involves a middle centre-row seat that can be slid beneath either of the outer ones alongside it to create a walk-through to the rear. All the middle- and back-row seats fold individually to create an increasingly large, flat load deck. The rear seats in the shorter model are divided 40-20-40 and allow the centre portion to be stored away and the outer parts to be shifted diagonally rearwards to create a roomy four-seater. Again, there is full fold-flat capability. Both versions are based on a new mid-sized platform that will eventually be the bedrock of up to two million Fords a year, including the next Focus family. The C-Max twins will be the first to use it, with sales starting around this time next year. The five-door is identical to the coup-like Iosis Max concept car from this springs Geneva show, apart from the lights, grilles and door handles. The seven-seater is taller and longer, with a stretched wheelbase to ensure good head- and legroom in all three rows, and slimmer roof pillars for better visibility. Blind-spot warning, semi-automatic parallel parking, rear seatbelt sensors and a power-operated tailgate and child locks will be available to boost safety and convenience. The front of the cabin is identical in both versions and takes its lead from the fashionable new Fiesta, although the seating position is higher and the gearlevers are mounted high in the dashboard within easy reach. The dash is wing-shaped and blends into the door trims and centre console, while the centre console area borrows from the mobile phone-inspired layout in the Fiesta. The first of Fords new Ecoboost direct-injection petrol turbo engines takes centre stage in the engine line-up. Its a 1.6-litre unit thats already showing 20% economy and CO2 emissions improvements compared with similarly powerful conventional engines. 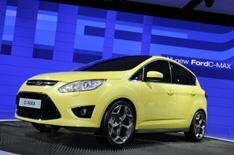 Ford plans to add 1.4- and 2.0-litre versions in time. The companys updated TDCVi diesels will also be available, as will the Powershift six-speed twin-clutch semi-automatic gearbox. 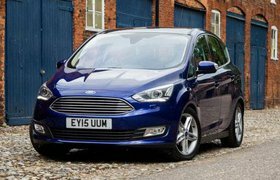 The new platform the cars are based on is expected to preserve the best bits of the current Focus familys driving abilities, while delivering greater safety, comfort, convenience and driver satisfaction similar to what was achieved with the latest Fiesta.